CALIFORNIA -- The owner of a Burbank animal shelter charged with abusing and neglecting hundreds of dogs and operating a kennel without a license is countersuing the city for harassing her. Pamela Miller (aka Pam Miller, Pamela Miller-Sackter, Pam Sackter, Pamela Sackter), owner and operator of Burbank Animal Sanctuary, filed a lawsuit in U.S. District Court accusing the city of Burbank of violation of her civil rights, false imprisonment, false arrest, intentional infliction of emotional distress, malicious prosecution, defamation, negligence and assault and battery. The Burbank resident named 24 people in her lawsuit, including a Burbank Municipal Court judge and a number of city officials. She claims authorities violated her civil rights by subjecting her to many warrantless searches of her home, embarrassing her, ruining her reputation and taking pictures only of the kennel areas that had not been cleaned. City prosecutor Eric Hovatter, who is named in the 26-page complaint filed June 9, declined comment on Thursday when asked about the federal lawsuit. He said only, "I haven't even looked at it." Miller could not be reached for comment. Messages left at the Millerwood Animal Sanctuary were not returned Thursday. The city filed a criminal case against Miller in August 1998. The matter was expected to go to trial last week. But Burbank Municipal Court Judge Aklan Kalkin transferred the case to Pasadena Municipal Court after Miller filed the federal lawsuit, because it named Burbank Municipal Judge Rand Rubin. Authorities were also looking for a public defender to represent Miller because her private attorney, Ira Salzman, was dismissed from the case last week. He cited a conflict of interest. Miller is representing herself in the federal lawsuit. Volunteers at Millerwood Animal Sanctuary first complained about Miller in September 1997. They reported to city officials that more than 100 dogs were malnourished and living in filthy, cramped conditions. The shelter opened in 1993 as a nonprofit organization to rescue and house hard-to-adopt pets, such as pit bulls. Miller's license to operate a kennel ended in 1998 and the city refused to renew it, Hovatter said. She appealed the decision and her appeal was denied in January. Burbank animal-control officials estimate Miller continues to house about 120 dogs in violation of city code. In Burbank, a person with more than four dogs must apply for a kennel permit. The conditions in which Miller's dogs live are "not good to very bad," Hovatter said. In documents she filed in federal court, Miller accuses former volunteers at her kennel of conspiring against her and launching a campaign to make sure she would lose her license. Miller calls photographs of the kennel conditions "manufactured" and accuses some of those named in the suit of stealing her dogs. The lawsuit claims that the purpose of the action was to "manufacture justification" for the Burbank animal-control agency and its superintendent, Fred DeLange, to close down her rescue operation. DeLange, expected to be a witness in the criminal trial, would say only that he is eager for it to get under way. 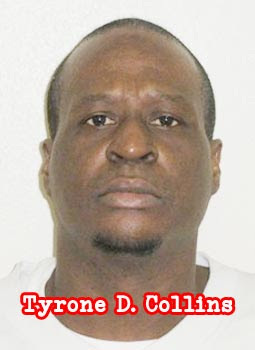 The criminal trial is scheduled to begin June 28. CALIFORNIA -- A Burbank woman whose former business rescued animals and found homes for hard-to-adopt pets is expected to be tried this week on charges that she abused and neglected hundreds of dogs. Pamela Miller (aka Pam Miller, Pamela Miller-Sackter, Pam Sackter, Pamela Sackter), owner and founder of Millerwood Animal Sanctuary, is charged with four counts of animal cruelty and abuse and 10 city code violations of operating a kennel without a license. Jury selection is expected to get under way today. Complaints about the kennel were first made to Burbank Animal Control in September 1997, said Eric Hovatter, Burbank city prosecutor. Volunteers at the shelter reported more than a hundred dogs were malnourished and living in filthy, cramped conditions. The city filed charges against Miller in August 1998. Her license to operate a kennel ended, and the city would not renew her permit, Hovatter said. Miller appealed the decision, and her appeal was denied in January. However, Burbank's city code requires a person who houses more than four dogs to apply for a kennel permit. Miller's attorney, Ira Salzman, disagrees with the city's assessment of the kennel conditions and said his client does not belong in a criminal court. The matter should be resolved by a continued zoning and appeal process, he said. "Pam is a well-meaning individual who is running an animal rescue operation. She's certainly concerned about the welfare of the dogs,'' Salzman said. He and Miller consider the conditions "very good'' in light of the number of dogs that she keeps, he said. Burbank Animal Control closely monitors the property, said superintendent Fred De Lange. His staff inspects the kennels once a week, he said. "It's not a good operation. It's dirty, and it's not something we want operating,'' he said. Although she might clean the cages on some days, she is not maintaining them on a regular basis, Hovatter said. The ideal situation for the city would be to find all of the dogs a good home where they will be fed and cared for, he said. NEW YORK -- While searching for a missing person in Corona early Monday, cops brought in a police dog, as is normally done. However, the dog and his handler found themselves in a fix when a pit bull attacked the German shepherd, police said. 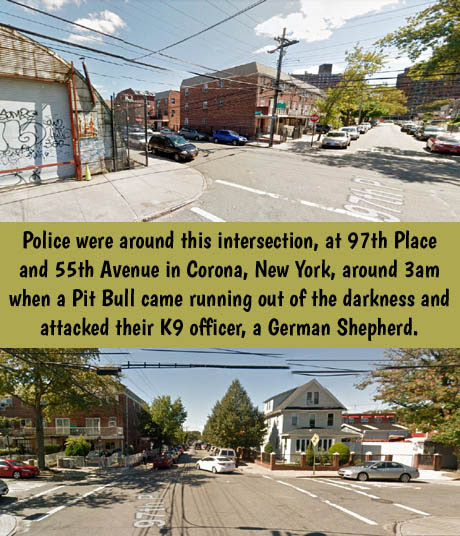 The pit bull attacked at 3 a.m. on 97th Place and 55th Ave. The cops had been searching for a 29-year-old woman when they suddenly had to deal with the ferocious animal, said 110th Precinct police. The police dog's partner fired a shot at the attacking pit bull. It was not injured, but it was caught and turned over to the Queens Animal Shelter.